Editors Note: There is a photo associated with this release. 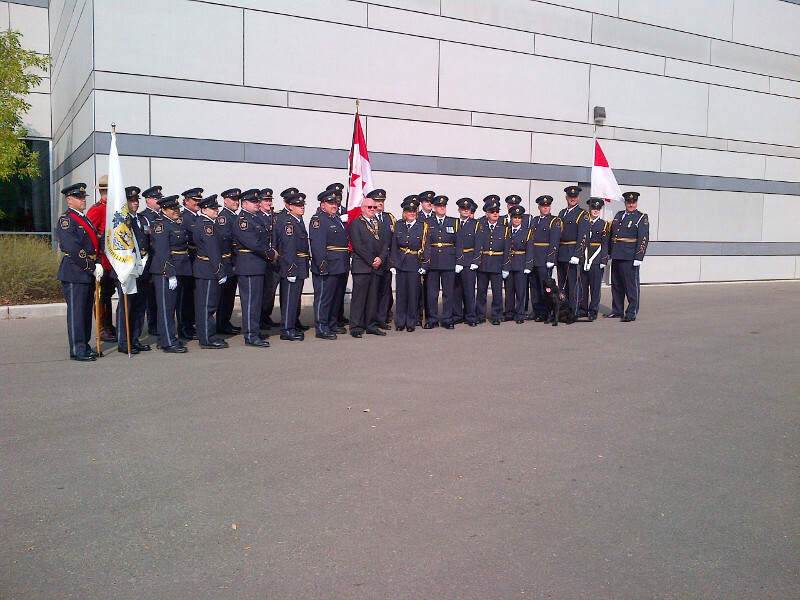 Today, Drumheller officially granted the Correctional Service of Canada (CSC) "Freedom of the Town", a rare privilege given to valued members of the community or groups with historic ties to the area. In this case, the honour represents Drumheller's appreciation of CSC's long-standing and dedicated service within the community. In the spirit of tradition, Drumheller Institution A/Warden Pattie Krafchuk, and numerous CSC staff marched to the front of Drumheller Town Hall, where A/Warden Krafchuk formally requested Freedom of the Town from His Worship Terry Yemen, Mayor of Drumheller. After a line inspection of staff, Mayor Yemen granted Freedom of the Town, and praised CSC for its service to the Drumheller area. Mayor Yemen also declared every June 1st as Correctional Service of Canada Appreciation Day, in recognition of CSC's 182nd anniversary of correctional operations, which precedes Canadian Confederation. During her remarks, A/Warden Krafchuk thanked the town of Drumheller for being supportive of the Correctional Service of Canada's public safety mandate, and thanked local residents for their dedication and commitment to the Service. Drumheller Institution first opened in 1967. The minimum security and medium-security institution has a capacity of 802 male offenders. Granting Freedom of the Town is one of the most esteemed honours that a municipality can bestow upon a group or individual. It is often an honour reserved for military units, allowing them the freedom to parade through the community. The Correctional Service Canada, then known as the Canadian Penitentiary Service, came into existence on June 1, 1835. "We are proud of our partnership with the Town of Drumheller, a partnership dating back 50 years and one that will continue for years to come. Thank you to the Town of Drumheller for supporting the work on making public safety paramount by assisting with reintegration plans." "The Town of Drumheller has benefitted from many positive partnerships over the last 50 years. The Institution's greatest asset has been the incredible community involvement by their staff over the last 50 years." Pattie Krafchuk, A/ Warden Drumheller Institituion and CSC personnel marched to Drumheller Town Hall in the Freedom of the Town Parade, Drumheller, Alberta September 9, 2017.